The global near field communication (NFC chips) market is anticipated to witness a tremendous growth in the period from 2016 to 2024 on account of the versatility and convenience of NFC chips. These chips also provide enhanced safety, driving their demand. The growing need for secure transactions can be felt worldwide and this is boosting the growth of the NFC chips market. NFC requires PIN and does not provide retailers with credit card information about users and thus, more secure. Also, the use of NFC causes no hassle and is easy to use for wide range of applications such as contactless payments, for providing authentication of information when required, and for information sharing. It is thus, no wonder that NFC is replacing other short range communication technologies such as Bluetooth. The growing adoption of NFC technology in smart phones and smart cameras is slated to fuel the growth of the NFC chips market in the years to come. There is a need for efficiency and reliable mode of information sharing and this is driving the adoption of NFC chips. The requirement of faster access to data across industries is also a key factor behind the growing popularity of near field communication technology. The growing advancements and investments by players within the market are expected to help the market to grow within the forecast period. The decreasing rates of NFC chips on account of the declining prices of various materials required for the manufacturing of these chips will make it very profitable for NFC market players. The increasing demand for connectivity between devices for information or data sharing will help the market to grow further. The growing adoption of online payments is another key factor boosting the growth of this market. North America emerged as the leading regional segment within the NFC chips market, accounting for 34% of the market in 2015. The key factor behind the growth of this market in North America is the partnerships between banks and enterprises, which is helping in tokenizing the cards that use NFC chips. The introduction of NFC reader modes, peer to peer modes, and card emulation standards is also helping the market to grow in North American region. However, it is Asia Pacific which will emerge as the leading market for NFC chips in the future. The Asia Pacific NFC chips market is slated to expand at a 27.90% CAGR between 2016 and 2024 on account of the growing penetration or use of smart phones in the region. Europe is also slated to witness a positive growth in the coming years on account of the high use of consumer electronic products in Western part of Europe. Growing applications of wireless technology is also helping the market to grow in Europe. The Latin America and the Middle East and Africa markets for NFC chips are also anticipated to do extremely well in the coming years. Smartphones are a key application area of NFC and thus, the smartphones segment has been leading in the NFC market. The growing demand for smartphones and increasing adoption of newer technologies is aiding the growth of this segment. The medical equipment and television segments are not far behind in terms of growth. The increasing disposable income of consumers worldwide will lead to a healthy growth of the television segment. The world NFC Chips market is prophesized to grow well owing to soaring demand of Near-Field Communication (NFC) chips in consumer electronics. NFC chips are widely considered versatile and convenient. Furthermore, NFC chips render high security and thus are in high demand as there is a growing demand for secure transactions across the globe. The report anticipates that the global NFC Chips market to be suitably segregated as application, by storage capacity, by end user and by geography. The category of smartphones that comes under the segment of end user is expected to gain momentum and spearhead the market with its phenomenal penetration across the globe. The analysts of this report have included a detailed analysis of the world NFC Chips market together with substantial focus on the competitive matrix of the market. Each of the geographic segments of the market has been thoroughly studied and assessed to divulge opportunities that had remained undisclosed so far and growth prospects that are very likely to emerge in the forthcoming years. The world NFC Chips market is predicted to gain impetus and experience substantial market growth due to a significant rise usage of consumer electronics and soaring disposable income of the people. There is an increasing need of secure transactions over the internet and NFC chips cater to that need. It requires PIN but it does not furnish the retailers with information pertaining to the credit card and its users and thus is considered highly secured. Besides, the usage of NFC is free from any kind of hassle and comes with an ease of use. It is used widely across many applications like for rendering authentication to information as and when needed, for sharing of information and for contactless payments. As such, for obvious reasons, NFC chips are seen replacing various short range technologies of communication such as Bluetooth technology. The increasing adoption of NFC technology in smart devices like cameras, mobile phones is likely to drive the demand for NFC chips market. As we all make a stride towards cashless society, there is a soaring adoption for online payments which further fuels the demand for NFC chips. These chips finds usage across a wide range of industries from medical to automotive to consumer electronics to retail and so on. With demand across so many industries, the market is poised for very high growth. Despite some retraining factors such as threats of substitutes as there is constant innovation and upgardation in the technology field, the market is poised for substantial growth. The category of smartphones that come under the segment of application is predicted to lead the market. So far as regional dominance is taken into consideration, North America is the leader of the market for NFC Chips and is foreseen to remain so over the forecast period that stretches from 2016 to 2024. Much of the growth of North America is attributed to the prevalence of partnership between various enterprises and banks. Furthermore, launch of various products such as peer to peer modes, card emulation standards, and NFC reader modes are all contributing towards the surging demand for NFC chips in North America. Despite such growth in North America, the region of Asia Pacific is estimated to expand at a very high CAGR rate owing to the burgeoning demand of smart phones and increased disposable income. 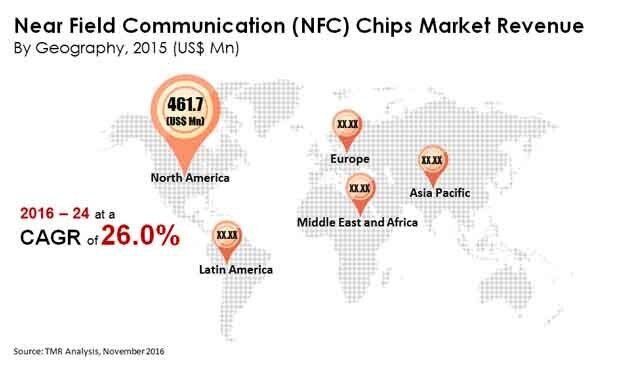 The report also offers a study on other important regions of the international NFC Chips market, namely the Middle East and Africa (MEA), Latin America and Europe. Some leading NFC Chips companies which are worth assessing and evaluating are AMS AG, STMicroelectronics, Qualcomm Inc., Texas Instrument, and Broadcom Corp. The analysis shares an all-inclusive insight of the basic characteristics and the nature of the market’s competitive landscape.